We Manufacture Continental Kits for Just About EVERYTHING! Most are EXACT Steel Duplicates of Factory Originals! The Continental Spare Wheel made its first appearance on Edsel Fordâ€™s Lincoln Continental in 1942. By the early fifties the Continental Kit was made and purchased for virtually every make of automobile on the North American market. In most cases it was an option directly from the car manufacturers. Because of its dramatic appearance, the Continental Kit has become a much sought after accessory and to this day typifies the spirit of the fifties. Continental Enterprises has been serving the old car hobby with a quality product from this era since 1976. We manufacture Continental Kits to fit over 200 different makes and models of automobiles from 1949 through 1999. Most are exact steel duplicates of the original Kits which were available as an option from the various car manufacturers. Contact us to receive information on the Continental Kit of your particular interest. Our reply will include a picture of the Kit mounted on the car, list all the components included with the Kit and the price. It’s the ultimate collector car dress-up accessory. 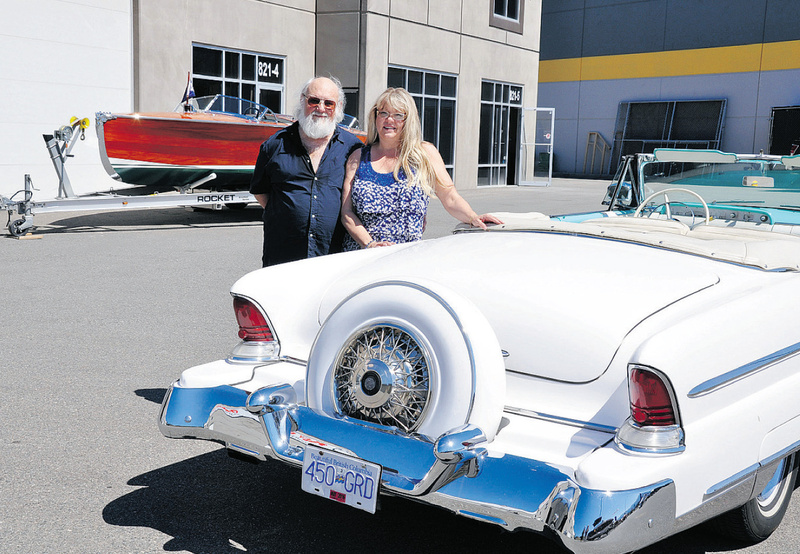 Sam Bronstein has always loved the long, low cars of the 1950s that were made even longer and luxurious looking with extended bumpers and the spare wheel mounted at the rear. As a kid, he would mount a wheel on the back of his Dinky Toys. His interest in continental kits would become his life’s work. Accessory companies, including Foxcraft, Stylecraft, Lido and Bonzer-Western, offered kits starting at $28. Huddleston- Whitebone offered a unique kit for the 1953 Cadillac Eldorado convertible featuring a button in the centre of the wheel cover that allowed the hinged tire carrier to fall backwards for easier trunk entry. Their next find was a Bonzer- Western kit to fit 1955 and 1956 Ford cars. The enterprising brothers duplicated this continental kit and advertised it for sale with a fibreglass tire ring for $295. They were overwhelmed with responses to their ad. He gradually built up the number of kits he offered, got a fabricating company to make the pans and carriers and packaged the kits up in his apartment for shipping. But the turning point for the business came when he got into manufacturing original dealer option continental kits. He had dies made up to press out the special wraparound bumper for mid- to late 1950s Chevrolet continental kits. These are exact duplicates of the General Motors-authorized accessory kits installed on new cars by dealers back then. The kit includes the original installation instructions. “Having dies made was a large and decisive step. It was a huge investment for me,” Sam recalls. Today, Continental Enterprises is run by Sam and his wife Patty and occupies warehouse space in a Kelowna industrial park. It contains metal-shaping equipment, a 100-ton press and hundreds of patterns and dies for pans and carriers. The company currently offers continental kits for more than 200 different models of cars. “There isn’t a popular car in the 1950s or 1960s that we don’t provide a continental kit for,” he says. The kits are priced from $895 to $2,195 and include either a chrome or painted tire ring and faceplate. There is a choice of a solid face plate or one for the hubcap in the centre. His daily driver is a 1955 Lincoln Capri convertible which is, of course, equipped with a continental kit. He has driven the car over 140,000 kilometres all over North America since buying it in College Park, Pa., in 1988. Web Site Contents are © Copyright 1998 - 2019 Specialized Automotive Marketing Inc., all rights reserved. Web Design & Development by Oracast.